Albert Pujols at one time was an unknown draft pick taken in the 13th round while playing at Maple Woods Community College. From playing college ball in Kansas City, Missouri to becoming the 32nd player to reach 3,000 hits and only the fourth in that elite group to also have 600 or more home runs Pujols has come a long way. On Friday night, Pujols lined out in his first trip to the plate but in his second at-bat Pujols hit a single to right field at Safeco Field in Seattle to reach the 3,000-hit club against Mariners pitcher Mike Leake. Pujols singled again during the ninth inning to pass Roberto Clemente and move into 31st place on the all-time career hit list with No. 3001. 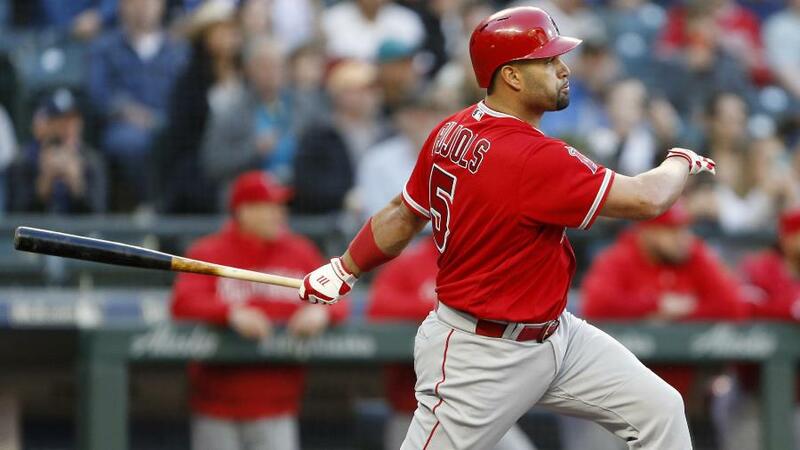 The Angels won 5-0 and Pujols went 2-for-4 with a pair of RBIs. With hit number 3,000, Pujols joined a group of just three players – Willie Mays, Hank Aaron and Alex Rodriguez – in the 3,000-hit/600-home run club. That further solidifies his spot in baseball as one of the best hitters to play the game. Pujols joins Adrian Beltre as the only two players born in the Dominican Republic to reach the 3,000-hit plateau. Leake said that he enjoyed the battle against Pujols in the at-bat in which the Angels’ slugger reached the milestone and has enjoyed watching Pujols play over the years. The hits have not come as frequently of late as before, but the first 10 seasons playing with the St. Louis Cardinals Pujols enjoyed one of the best ever decades for a Major League Baseball hitter. He averaged .331, 41 homers, 123 RBIs and 190 hits per season. He was awarded three NL MVP’s and finished second four other years. After being drafted, Pujols played just one season of minor baseball and become a full time member of the Cardinals in the 2001 season. He started on Opening Day in left field and his first hit was off Colorado Rockies pitcher Mike Hampton. In his fourth game, he hit home run number one off Arizona’s Armando Reynoso and his hits and home runs started accumulating quickly. In his first season, Pujols batted .329 with 37 homers and won the Rookie of the Year award while coming in fourth for MVP. After playing 11 seasons with St. Louis and winning two World Series, Pujols signed a deal with the Los Angles Angels for 10 years and $240 million.